In Borneo Island, there is always something for you to do. One of the is to see our beautiful wild orchid of Borneo. Weekly Gaya Street Tamu in Kota Kinabalu is one of the place for you to go to see wild orchid of Borneo although most of the orchid that being sold in Gaya Street Tamu are not taken from the jungle but was produced for commercial purposes. However those are originally a wild orchid in Borneo. There are a few beautiful wild orchid of Borneo that you can see here in Sabah, Sarawak or even in Kalimantan area. I put some of them below for your reference. Those are the most popular wild orchid in Borneo. a. Phaleanopsis bellina - formerly known as violacea var. Borneo, is endemic to the island of Borneo and grows in Sarawak and Kalamantan. Plants are found in nature growing in a pendulous fashion, with 2-3 inch green flowers that have purple markings on the lower sepals. They are extremely fragrant and can bloom for several months, particularly in the spring and summer months. When these plants mature, they will develop large, wavy, shiny green leaves. b. Phalaenopsis violacea - native to Malaysia and Indonesia. 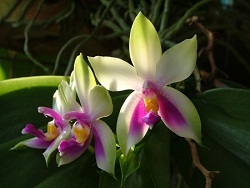 The plants are fast growing and are easier to grow than Phalaenopsis bellina. This Sumatran strain produces fragrant flowers that have the scent of bubble gum with a hint of cinnamon. c. Dossinia marmorata - has dark green leaves with silver and white veins. Its small white flowers are borne on a spike, as are those of the Southeast Asian species Anoectochilus roxburghii, A. sikkimensis, Dossinia marmorata, Ludisia discolor, and Zeuxine strateumatica (also found in southeastern North America). d. Slipper orchid - The most expensive wild orchid of Borneo. f. Bulbopphyllum reticulatum - One of the rarest of the bulbophyllum with reticulated darker blue-green striations over a yellow green background. g. Bulbophyllum lobbii - A beautiful species with oval foliage. The flowers are 2" to 3" in size. I love plants especially orchid. I got a few at home back in my hometown but it seems they are not doing so well in Kudat area due to the warm temperatures.